Chris Powell introduces an extract from a new book by Sarah Carter about the legendary creative and his most famous campaigns. The Independent described him as "the best TV commercials creator in Britain when Britain was the best in the world" and The Guardian as "the greatest TV advertising author of the late 20th century". But John certainly didn't think he was Mao and wouldn't have thanked us for a book that reprised his thoughts and work as miraculous, perfectly conceived gems. What the author Sarah Carter has done is capture the long and winding roads that led to some of his greatest campaigns by getting those involved at the time to put down their memories of those journeys. John wasn't just extraordinarily talented, he was remarkably resilient and fecund. If one route was closed off, he'd have another, probably better, idea the next morning. He was a magpie picking up trifles from all over to use one day - a snippet of music he'd heard driving in, a remark overheard in the pub, a gesture from a film. All were stored to be brought out when the opportunity came along. Much of the humanity and charm that epitomised his work came from this observation of the quirks of his fellow human beings. Unlike many ad creatives, John was foremost a craftsman. For others, the idea would be the high point; for John, it was the jumping-off point. It would be honed and changed endlessly, even at and after the shoot, to make it as good as it could be. He would take charge of every stage along the way, eventually directing most of his own work. Reading about Sir Jonathan Ive at Apple is reminiscent of John: soberly dressed, diffident, exacting, working long hours, crafting to perfection. We were very lucky to have him. Chris Powell is the former chief executive of BMP DDB. Although hindsight is a wonderful thing, Campaign's "Ad of the Century" had a surprisingly inauspicious start. Nobody working on the Cadbury account at the time at BMP had any idea they were creating advertising history. As the then account manager Chris Powell recalls: "We took three animatics out to research. One was about an archaeologist. I can't remember the second one. And the third was the Martians. I certainly didn't look at them and think 'the Martians is it'." Stanley Pollitt had refused to take the Martians script up to present to the Cadbury client when he first saw it. The client far preferred the two more straightforward ideas that were being researched alongside it. And Peter Jones, a planner on Smash, was sceptical too: "When I first saw the idea, I liked it, but it just felt very off the wall, really. Was the Great British housewife Smash buyer really ready for this?" It was 1971 and things weren't going brilliantly for John Webster at BMP. John had been at the start-up for three years but was feeling embarrassed that he hadn't yet done anything of note. Cadbury, a £350,000-billing founding client, had trusted BMP with its Smash brand of instant potato. But things weren't going too well on the account either. Since the Pritchard Wood days, Smash had been running a workman-like campaign dramatising how "real" Smash tasted, by showing people simply not noticing its mash was made with dried potato. The endline was: "Cadbury's Smash never causes much excitement. But then who ever gets excited over perfect mashed potato?" At the newly formed BMP, John's next ad in this campaign was a disaster. The black-and-white ad (not researched because it was an established campaign) featured a couple eating sausage and Smash in silence, except for a ticking clock and the husband pronouncing: "It's raining." Labelled "Christmas in the workhouse" by the agency, such was its bleakness, BMP recommended a write-off. Cadbury agreed - eventually also agreeing to pay the write-off cost, but only on the understanding their future ads would all be researched, which they would pay for as "insurance". And so, desperate to avoid a repeat of the Smash write-off embarrassment, the animatic and mandatory pre-testing of all ads at BMP was born. At Pritchard Wood, planners had used a stills projector to show slides synched to a sound tape to passers-by who roughly fitted the target audience. Now, though, in a technique involving late-night sessions at BMP wrestling spools of tape, and the holding of pictures up in front of two cameras, BMP produced animated drawings set to a soundtrack. The animatic was born. With video players emerging in 1969, BMP planners could now set off round the country to show their animatics to people slightly more representative than those passing a Soho ad agency. Physically, this was no mean feat. It involved planners lugging on and off trains a suitcase containing a Philips video machine in one hand and a TV monitor in the other. Pollitt once said that the reason there were no female planners at BMP then was that none were strong enough to do the job. But back to Smash. After the write-off debacle, three rounds of research on new ideas took place using the new animatic technique. These included one Gabe Massimi idea with the endline "British girls are Smashing" - a fairly lame excuse, it seemed, for lots of cuts of pretty girls in skimpy outfits eating mashed potato. Finally, John came up with an idea that worked: to switch things round so the potato ("It's good. But it will never catch on ...") was shown as a new rival substitute for Smash. The ad was "serious rival". Massimi hated it, threatening to fire John if the ad went through. But it researched well and it was made. Massimi subsequently left the agency. And John finally had the BMP ad he could be proud of. John later recalled hearing through the grapevine how John Salmon of CDP (the agency John most admired) had gathered all his creative teams in a room, played "serious rival" and said: "Now that's what I call a great commercial." The seeds of the Martians were now sown. Picking up on the early 70s obsession with all things space-related, John's next Smash ad featured a spaceman helping himself from an automat to meat and veg in pill form. But the only "proper" food he chooses is Smash. Endline: "There'll never be a substitute for Cadbury's Smash." Chris Wilkins (John's copywriter at the time) recalls: "This kind of inversion of ideas was very much how John's mind worked. He delighted in paradoxes and verbal tricks." Chris takes up the story: "One of the things we wanted to do for Smash was a 60-second Christmas special. We were both great fans of the American comedian Bob Newhart, who did a very funny monologue of a bewildered Elizabethan talking on the telephone to Sir Walter Raleigh about tobacco. 'So you roll up these leaves, Walt, and you ... stick 'em in your mouth, right? And then what do you do? You set fire to them?' We wanted to get Newhart to do the same thing for the potato, also introduced by Raleigh. In the end, Newhart proved too expensive and John took a week's holiday, leaving me to come up with another idea. I knew there had to be some mileage in the idea of somebody never having seen a potato before, and from that came the "Martians" script, which I wrote with Roger Shipley, the louche and delightful head of TV production at the agency. "On John's return from holiday, I was nervous of exposing the idea to him, but Roger told him the idea over a pint in The Ship in Wardour Street. John grabbed me by the shoulders, yelling: 'It's the commercial of the year!'" Roger puts it nicely: "John saw the beauty and stupidity in the idea." John later recalled: "We said to the client: 'Do you mind if we shove this into the research alongside those other two ideas as a bit of a joke?'" Powell has pointed out that, with many creatives, the script was as good as it got, and it was downhill from there. John was different. After the script, his ads kept getting better and better. And so it proved with the Martians. There is nothing intrinsically appealing about a Martian, but when John drew their beady eyes, wide smiles and pincer hands, they somehow became endearing. It was their voices, though, that were perhaps key to their appeal. Peter Hawkins at that time was a celebrated voiceover artist for a string of children's characters, such as Zippy from Rainbow and Captain Pugwash. He was also the voice of Doctor Who's Daleks. Inspired by the popular Laughing Policeman song at the time, John recalled how he rang Peter up: "Can you come down to the recording studio and have a go at laughing like a Dalek?" The animatic was ready to take out and show to some Earth people. Despite the planner Peter Jones' initial concerns, the Great British Smash buyer proved more than ready for the Martians. The ad sailed through research untouched. Bored with rival dried potato brands banging on about their quality ingredients, women loved the infectious charm, humour and sheer lunacy of the Martians. And they particularly loved the laughter. The other two animatics didn't stand a chance. And the client had no choice but to go with the Martians. Bob Brooks, the veteran American director, shot the film. And the rest is history. John once joked that it wasn't so important that his campaigns "had legs" as whether they had four of them and they were hairy. Lauded above all else for creating characters that gave larger-than-life personalities to the most mundane grocery brands, John made it seem so easy. But it wasn't - which is why clients queued for him to work similar magic for them. very like an actor doing a role in a feature film, I suppose. I started to write biographies of them for the clients. The commercials were like mini programmes in a way, with well-rounded characters who were real to people, particularly the young. Whereas Ronald McDonald, he's so bland. He's got no character - he just smiles." It was 1976 and Quaker had moved its Sugar Puffs account to BMP. Sales were not doing well. After a successful campaign in the very early years of the brand using Jeremy Bear, more recent advertising featuring Noel Edmonds talking about the goodness of Sugar Puffs for kids had failed to convince mums. As puffed wheat coated with a lot of sugar, good for kids they weren't. In their analysis of the market, the BMP planners recommended instead a focus on honey as a "good" form of sugar to appeal to mums, and that the new campaign should target mums and kids. This was quite a radical strategy at the time. In fact, the brief was possibly one of the first to mention the word pester - the campaign was to encourage kids to pester mums for Sugar Puffs. And mums would be happy to buy them because of the honey. In those days, BMP had a particular way of briefing creative teams, which they called "narrative creative briefing". There was no fixed creative brief form. No boxes to fill in. No client sign-off. Instead, after spending hours conducting numerous groups with the target audience of the brand in question, planners just wrote a paragraph or two on a bit of paper. This acted as an aide-memoire to the important bit - which was the verbal briefing to creative teams. This narrative briefing was made for John. The planner would sit on the sofa in John's corner office and talk for half an hour or so. And John would listen intently. He was a fantastic listener - and he loved nothing more than hearing anecdotes and quotes from the groups. As Chris Mitchell, the Sugar Puffs planner, recalled: "John would always look for and spot the quirkiness in a narrative briefing. He was great at spotting some off-the-cuff, odd comment and building it into something amazing. I worked on Quaker Harvest Crunch too at the time and John was just fascinated by the way I said 'crunch' in my Lancastrian accent. He would say: 'Say it again ... Say it again ...'"
In the Sugar Puffs briefing, John's ears pricked up when Chris mentioned that mums often referred to their kids as their "little monsters". He hadn't heard this before and it intrigued him. This formed the basis for John's idea for Sugar Puffs: monsters who were desperate to eat Sugar Puffs. But the first incarnation of the idea didn't work at all. In the first animatic, the monster was portrayed as child-sized. This came back from the research as all wrong on two fronts: children said it was wrong because monsters are meant to be huge and do things like crash through walls and smash through windows. The mums didn't like it either because the monster was seen as a bad role model - reminding them of a badly behaved child. It often seemed to be the case that, faced with research saying an idea wasn't working, John just turned the idea upside down. It happened with the Humphreys - when people rejected them because they looked so horrid, John made them invisible. This idea inversion happened with the Honey Monster idea too. After listening to the findings from the planner, John had a simple but inspired idea: "Let's make the monster massive." This immediately changed the monster from destructive (bad) to clumsy (endearing). Genius. Additional "layers" were then added to the idea. Inspired by a character he'd seen on the US Andy Williams Show called The Cookie Bear (a character in a bear suit that would constantly interrupt Williams, shouting: "Cookies! I want cookies! "), the Honey Monster began to take shape. Now the backstory of the Honey Monster was written. John imagined that many years ago in Africa lived animals called honey midgets who ate only honey. Some escaped, only to find themselves on a remote island where the only honey was very high up in the trees. Over time, the honey midgets evolved into honey monsters so they could reach the honey. One day, Henry, a middle-aged, somewhat camp bachelor came to the island with the navy and took a Honey Monster back to live with him. The monster thought Henry was his mummy. Hence: "Tell 'em about the honey, Mummy." Warren Dechter, the Quaker client, an American who had only been in the UK a short time, remembers feeling bewildered, to say the least, by all this when the idea was presented to him. A camp bachelor playing mummy to a giant, yellow honey-loving monster, for a cereal aimed at mums and children ... It all seemed at best, surreal. But the animatic sailed through research. Mums loved Henry McGee (famous as Benny Hill's side-kick from his show at the time) and they loved the way he said: "I'm not his mummy." Kids loved the way the Honey Monster did all the things they themselves dreamed of doing: smashing through walls and the like. And with honey mentioned eight times in the 40-second ad, there was no question that people would remember that bit. Dechter may still not have quite understood why this all seemed to work so well, but it was hard to argue with the research. He had been to the groups and seen the reactions first hand. So, after a brief hiccup when BMP was forced to hire very expensive lawyers to fend off a challenge from The Andy Williams Show regarding copyright of The Cookie Bear, the ad was made. Sales went up immediately. Kids shouted "Tell 'em about the honey, Mummy" up and down the country. Collectable Honey Monster cards were swapped in school playgrounds. Honey Monster cuddly toys were bought. Honey Monster even went on to star in panto in Bournemouth. And the campaign ran and ran. In 1986, an ad that didn't look like an ad hit our TV screens. Silent, and shot in grainy black and white, "points of view" for The Guardian went on to win a gold Lion at Cannes and topped a 2003 Campaign poll for adland's Favourite Advertisement. Created by John when he was 52, "points of view" is still ranked today by many leading creatives as the best TV ad ever made. At a time when most newspapers forcefully reflected the views of their proprietors, The Guardian briefed BMP for a new idea that illustrated its unique independence, with all that implied. John came up with a number of ideas dramatising different implications of this open-mindedness. But it was the idea of using a cinematic metaphor to illustrate the paper's unbiased policy that was to become advertising legend. John recalled how his inspiration for "points of view" was a simple truth: "I was working with Frank Budgen at the time. We got the idea from thinking about how, when you hear people who are witnesses to an event or a crime talking about it, it sounds like three different things have happened, because they all have a different take on it." Their original idea for this ad never made the light of day. The first script featured a street fight. A policeman standing over a black teenager and apparently wielding a truncheon at him is eventually revealed to be protecting him from a white skinhead gang. Perhaps not surprisingly, Peter Preston, the Guardian editor, felt it was far too contentious to make. "As you can imagine," John said later, "the ad was turned down for approximately five hundred reasons." After another iteration featuring a Japanese man apparently attacking a politician, the final "skinhead" script was eventually agreed. On being presented with the script, Preston told John that it managed in 30 seconds to summarise everything he believed The Guardian was about. As a renowned comedy director, Paul Weiland was perhaps a surprising choice as the director for this film - he never quite worked out why John did choose him. "It was the one straight, grown-up ad I ever did," he muses, "but it changed my life." Paul knew as soon as he saw the script that this was a stunning piece of communication: "You don't often get intelligent ads to work on - to be able to tell such an amazing story in 30 seconds is just incredible." John's start point for the journalistic, photo-reportage look he was seeking for the film was a famous Don McCullin photograph featuring armed British soldiers running down an Ulster street. The South London shoot was by no means plain sailing. John was fixated on his plan that the film would be shot for real - ie. with three different cameras filming exactly the same action at the same time. He felt it would severely compromise the integrity of the ad not to do this. The whole point of the idea was the same action seen in different ways. This gave Paul a real problem, though. He recalls: "In those days, you couldn't hide the cameras by painting them out. I wasn't that experienced then and I spent half the day (and the shoot was only a one-day shoot) trying to please John and hide the cameras so one camera wasn't seeing any others, but I just couldn't get the right angles. There was a lot of arguing as I tried to reassure John that no-one would ever know it wasn't the same action." The impasse was only resolved eventually when things started to get out of hand with some locals. Paul remembers: "The shoot was in Southwark - a really rough area. The last frame used rubber bricks, and some local thugs had got hold of these and were hurling them at passers-by, who thought they were real bricks. John was getting nervous, and eventually said: 'You know what? Just shoot it the way you want and let's get out of here.'" With typical understatement, John did later admit that "the director in the end did a pretty good job of it". Paul shot a number of other scenes - for example, of a little boy playing with toys in the street that were kicked into the air as the skinhead ran past. Visually, these were exciting. But, in the end, it was felt that the film worked best when stripped down to its bare essentials. But, as ever with John, it didn't end there. He was famous - infamous even - for his relentless desire to improve, refine and perfect, right up until the finished film sign-off. Many a client recalls getting a call from John in an editing suite saying he'd had another idea that was even better. As David Batterbee (an account director in the early BMP days) recalls: "When John was involved in something, he was relentlessly involved in it. He would never lose enthusiasm. Like Hockney, who never does a lazy mark on a bit of paper, John put so much loving, technical care into everything he did." In an interview, John once explained: "I always think the script is the start of the journey, not the end. A lot of people have so much trouble getting a script approved that they kind of switch off after that and stick to the storyboard. But this is a mistake ... very often after that, little details can lift the thing from being ordinary to being distinctive. You should always be on the lookout for that, right up to the end. Always keep the door open. Something wonderful might happen." This film is a classic example of that philosophy. John always believed that, above all else, what made "points of view" so successful was its complete silence. "With no soundtrack at all, you just watched this action going on - it's hypnotic," he said. "The silence kind of emphasised the events." It was never planned this way, though. The film was intended to be accompanied by sound effects of street noises and the protagonists shouting. But when John and Paul looked at the rushes before any sound had been added, the film felt so dramatic and tense that immediately it was clear that it was more powerful left silent. The result: the definitive ad for a liberal newspaper. And, for many, the definitive ad. 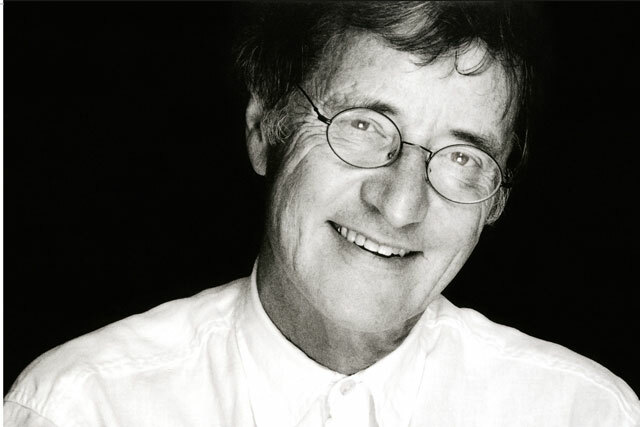 For more information about John Webster: The Earth People's Ad Man, please contact fiona.mitchell@adamandeveddb.com.